We headed straight for Istanbul and a parking spot beside the Bosporus. It was Sunday and crowded. Eventually most of the cars left and we moved to a more level place. The people still around indicated that we should actually move to a flat cement paved area behind concrete bolsters meant to prevent parking there! The bolsters were moved to allow us in and then moved back. There was a policeman on duty right there. We found out the next day that we were parked outside the Chinese Embassy. We stayed in that spot for our full stay in Istanbul. Staff from the Chinese Embassy came to stay and were pleased we intended to travel to China. The map on the side of the van was a great help in communication. The police had very little to actually do and spent much of their time fishing. When Pieter took out his air rifle they also enjoyed target practice - they wanted to shoot fish and birds though not plastic bottles. Lucky for the wild life they were all poor shots. The boulevard was vibrant with fishermen, walkers and people relaxing. Nazim and his wife Sariha were really marvelous. Besides speaking good English Nazim was able to tell us where to have our cushions recovered, where to have the Landy serviced and invited us to his home for a shower and to do a load of washing. He has been retired for some time but owned a panel beating business and is well known in the area. We joined them several times on the boulevard and shared snacks and companionship. The fish was delicious. We went to a restaurant and ate starters only. They were presented on small dishes on a tray and we chose marinated sea bass, sea bass another way, mackerel, calamari, crab pancakes, shrimp in potato, seaweed in garlic. All small portions and beautifully served. We finished with coffee. Other times we bought take aways. The best was the mussels covered in flour and deep-fried. Mussels in their shells stuffed with rice was also fantastic. We also ate fish in a small Cafe in the fish market. Cheap and delicious. We managed to do some sightseeing. The Blue Mosque famous for its blue tiles and the Aya Sophia. Once a Byzantine Church, turned mosque, turned Museum. The day we wanted to see Topkapi Museum it closed early. Pieter had a chance to shoot with another air rifle as well. There were several shooting galleries on offer. The one he used in the photo was very old and held together with metal bands. He only got in two shots though. He hit a balloon both times and there-after the vendor did not put a pellet in the gun! Istanbul roads are very crowded and parking difficult to find. So we left the Landy and traveled by bus into the centre of town. The journey took over an hour along the Bosporus, a lovely drive. One we became quite familiar with. We managed to find an English language bookstores in Istiklal street and purchase guides to Iran, India and South East Asia. A book on Ataturk by Patrick Kinross was included in our purchases. You cannot go far in Turkey and especially Istanbul before coming across a picture or statue of the man. He should be placed among to top figures of the 20th century. He prevented the division of Turkey between the allies after the First World War and then proceeded to drag the country out of the middle ages and into the modern world. His achievements include the emancipation of women, the secularization of government, developing a new script based on Roman script, developing a definitive Turkish language and ensuring literacy. More than those great men Nelson Mandela and Mahatma Ghandi achieved. Wednesday 6 June to Thursday 14 June 2007, Black Sea Coast. This morning we picked up the cushions with their new covers, bought a new portable generator and finally left Europe. We are now officially on the Asian part of our world tour. I have been to Asia thirty odd years ago and Pieter has been to Hong Kong, but apart from that it is new territory. Not like the familiarity we had with Africa and the luxury of Europe. Iran will be the true start though. The coast road goes through natural forest, green hills, green valleys and small villages that are a little run down although there is much new development. It twists and turns between small coves. We averaged about 175 k per day for 4 days to Sinop. After this the road straightened. At Samsun we came across the first really long beach and a lot of holiday development. The season only lasts for 2 months though, July and August. The first night it rained. The rain poured through the back door of the van. The new cushion covers now have a water mark on them! The rain let up for a few hours in the morning. Enough time for Pieter to look unsuccessfully for the leak. He cleaned all the rims though and the problem has not reappeared. Pieter is very good at taking all kind if things apart, cleaning them and putting them back together. After that the problem usually is solved. In Fatsa we stayed next to the Camlik Otel. I was given a rose by the owner and we were invited for tea. It relies mainly on weddings and other celebrations to make a profit. Weddings are attended by 300 plus guests, many not actually invited. It is normal for invited guests to bring their friends along. Different to our experience where you can expect fewer guests than invitations sent. We ate our way through kilograms of cherries all along the coast. The fat black ones are the very best. The Roman general Lucullus saw cherries for the first time in Giresun and liked them so much he had them introduced into Europe. Trabzon was a magnificent experience. Trabzon's history stretches back to the 7th century BC. It is situated at the very heart of road, railway, sea and air connections - an important sea port for east-west connections and part of the transit route which leads to the south east through Erzurum to Iran. It has played a major role in the initiation and development of trade between the East and the West. Communism reduced its importance as a trade link but it is now regaining its former importance. We parked on the boulevard and were immediately inundated with 20 year old university students studying computer engineering. We had tea with them before returning to the van. We were then interviewed for local television and by the local newspaper. It all made us feel very special. We visited the Ayasofya Museum. The interior houses some impressive Byzantine frescoes and on the exterior are a number of reliefs. NB: Some of these photos were taken with our Sony camera. The zoom starts at wide angle and goes to panoramic making good photos difficult. Unfortunately Pieter fell with the Nikon in his hand. He was not badly hurt but the Nikon is virtually unusable. Yesterday we celebrated our return to Turkey with a meal at a typical Turkish Restaurant. It is rather like a buffet except you point out what you would like. Tea and bread are included. Pieter had mince meat patties and I had a delicious stew accompanied by salad. We also bought some Oriental pastries for later, along with a bag of cherries naturally. Once we arrived in Erzurum we had a very busy time. First we found the main Post Office where we expected to pick up a letter from SA. Next was the Iranian Embassy. It was open but I did not yet have passport photos in a scarf but at least we know where it is. Then finding a shop and having the photos taken. After this the priority was a new tyre to replace the one we lost in Georgia and a 12 volt light for the kitchen area. The tyre became quite an exercise. We have Goodyear tyres and must obtain exactly the same tyre. After going to several shops in various places we finally located a shop that found that a tyre was available in Istanbul. They arranged for its delivery on Monday. The search for a 12 volt light also took some time. Eventiually we came to an electrical repair shop. The owner sent his assistant off somewhere to find one for us. In the meantime we were invited to eat lunch with them. This was cooked in the shop and consisted of pasta on a large round plate with yogurt in the centre and served with bread. Everyone had a spoon and ate from the communal plate. We asked the police for good place to stay. They took us to car park near centre of town. It was very noisy especially when the 4 skips were emptied and the rubbish accumulated nearby cleared with spades..... all in the middle of the night. We returned to the Iranian Embassy on Friday to apply for the visa but they were closed. This time we headed out of town for the night. We found a Mosque that looked deserted with a tap outside. The Mosque was used occasionally by the nearby farmer and anyone who happened to be using the tap to clean their car at prayer time. Unfortunately the source of the water had been damaged and it was not always clean. The farmer was happy to give us decent water though. I went there to fill up and was given a scarf by the farmer's wife. She felt I really needed something to cover my hair! Poor me, not properly dressed. The attitude towards women is very conservative here. This explains why I was given a scarf to wear. I was also asked if I had a scarf where we wild camped on July 1st. In deference to local custom I wore one whenever visitors came. We ended up staying there for the weekend. Pieter was not at all well and resting was the best thing he could do. On Monday we returned to Iranian Embassy. First we had to be let in, then we had to sit and wait for someone to come and attend to us. Eventually a man came through and dealt with the people waiting. We had to pay Euros into a particular bank then return to hand over the actual application. All our sources have said USD is best for Iran. Bank and credit cards cannot be used due to sanctions and a visitor must have hard currency. We are wondering though if the situation has not perhaps changed and Euros may not be better. We will take a selection of both to be safe. We checked for mail at the Post Office and picked up the tyre. Thank heavens for the GPS. We would never have found the shop again without it. The shop is in one of the myriad of small streets around the centre. Pieter was not pleased though that the tyre had to be balanced on the Landy. This is not good for the diff. When he took the Landy to have the wheel balanced he passed an MMM Migros, a largish supermarket. This became our overnight parking spot. Much quieter than elsewhere. By Tuesday we were starting to be concerned about the non-arrival of the letter. When we checked with David that evening he told us he had sent it to the main Post Office with DHL and that it had arrived in Istanbul. Luckily we had already made contact with Serhat at the PTT. He speaks English. Wednesday we returned to his office with the DHL tracking number and he spent hours tracing it. According to the DHL tracking system it was still in Istanbul. In reality it had been passed on to Alas Delivery who were transporting it to Erzurum. It was on its way and was at that moment in Erzincan about 200k away. It arrived at Alas Delivery at 3:00 pm. The letter contained our new debit and credit cards so it was vital to us. Besides Serhat spending so much time tracing the letter for us, Abdul also took us for lunch. At least this time we had already purchased a box of chocolates for them because of all the trouble they had gone to. The Turks are exceptionally helpful and generous but we never have anything to give in return. We left town immediately but stopped very soon at a P Garage with shade and a water tap. Pieter had almost recovered from his previous illness, now he had a very bad case of diarrhea. I had a mild attack. He spent a full day in bed. On Friday we cleaned out the Georgian mud using their high pressure hose. I have now started to drive again after a 2 year break. Pieter's illnesses made it imperative that I be familiar with the Landy. Pieter will still do most of the driving though as he enjoys it so much. We headed west hoping to take a turnoff south through the mountains. There was an army checkpoint at the start of the road. The man on duty could not speak any English except 'no'. He made it quite clear we could not drive along the road. We ended up going through to Erzincam and taking a road south from there. There were many police checkpoints along the road plus an army presence. Some of the road blocks included sandbagged enclosures and rifle wielding policemen. We speculated that this is either due to the Kurdish unrest or the elections or maybe just protection for all the dams in the mountains. The scenery is magnificent. We followed one of the rivers that eventually become the Euphrates. Mountains, river valleys, ravines - what more could we ask. Faster driving perhaps. The roads are again very winding and steep. We needed a break again to wash clothes and bedding. Pieter also needs to rest as he is not fully recovered. We found a place near a clean water source and set up camp. I managed to wash sheets in a small bucket. They are fresher but I do wonder how clean. Across the road was a farm house with a mother, father, daughter, Murveet and son-in-law, Sezer. Murveet and Sezer were both 15! But Sezer assured us they were married. They were very interested in us and our van. We invited them in and showed them around but mainly sat outside. The van is way too hot. We also went across to their house and sat in the garden under a cherry tree eating cherries straight from the tree. Marvelous. They have quite a large property and grow their own vegetables. They also have several mulberry trees. The mulberries are small and white. They wait for the fruit to drop, collect it and dry it. I think the dried fruit is delicious and very sweet. Pieter is not so keen. Pieter shot the rifle much to the interest of the men. The father produced his own (unloaded) pistol out of his pocket and explained that he would like Pieter to come along with him to shoot deer with him. Pieter made use of the opportunity to take the handbrake apart. Oil has been leaking onto it and he wanted to see where the oil came from. He found that the pads were also completely worn. No wonder we have had very little benefit of the handbrake! We decided to head back to Erzurum to have the handbrake fixed at OtoKar, the Turkish Land Rover specialists. This meant going back north through the mountains, which, based on our recent experience, could take a few days. It turned out to be relatively flat and a very good road. At Elzig we stopped at a garage for lunch and were given cherry juice to drink instead of tea. Lovely. I am getting used to drinking strong tea without sugar. In Turkey the sugar is served separately. Many people put a sugar cube in their mouth and drink the tea through the cube. Pieter is now an expert at drinking his tea this way. 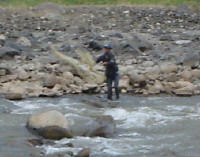 We stopped by the side of a stream and watched a fisherman walk upstream continually spreading his net. Neither of us saw him actually catch anything. Two boys also using nets did catch a small fish each. We now know why we could not find the road south from Erzurum. Due to road works It goes into an unmarked very rough dirt track on the outskirts of town. The other way was much nicer anyway. We had the handbrake fixed at Otokar, found someone to fill our gas bottle and look for a part for the portable generator (brand new, and yet the coil failed!!). We spent Friday at the Internet Cafe updating the website, placing adverts on e-Bay for the Renault and canopy and downloading the Pakistan Tourist Board website. If we do not find a guide for Pakistan still we have plenty of information. I had a very informative conversation with a young university student. We discussed the elections to be held on 22 July. In Erzurum there are 3 parties involved, the CHP, DP and AK Party. He supported the AK Party which is apparently the one currently in power. They are promising to provide free primary and secondary education and to improve the hospitals. Eastern Turkey is backward with girls only attending school until 11 or 12. If they stay at school longer they start thinking that they can date boys - other than their future husband chosen by the parents. This brings shame on the family. However the government is going to make further education compulsory for all children until 15. The constitution came up. The fifth clause states that the first 4 clauses cannot be changed. These clauses deal with the secular government structure, the immutability of the borders, the language and the flag. Means the complete revamp of the middle eastern borders proposed by an American cannot be implemented. The proposal takes from Turkey, Saudi Arabia and Pakistan and gives to the Kurds, Jordan and a special Islamic holy state incorporating Mecca and Medina. We picked up our Iranian visas in the afternoon. When we applied Pieter was not well and just sat there while I took care of things. This time he was fine and the man behind the counter would only talk to him! After one false start we found the right road and headed back south towards Bingol. It was relaxing to follow the same easy road. The hay harvest is in full swing. Much of the work is done by hand and it is mesmerizing to see a group of men using their scythes in sync. Hard work though. While driving towards Namrut Dagi we saw a sign for camping but did not catch the name. Next minute we were overtaken by a minibus who pulled over and indicated he wanted to talk to us. Pieter pulled over and it was the owner of the Kommagene Hotel and Camping. We followed him onto Kahta to a basic campsite. It is a place to spread out and relax. He also organizes tours to Namrut Dagi and we decided to go on the tour and let someone else do the driving and navigating for a change. The roads were as described, not very good in places and with 180 degree turns. The tour visited the Karakas Tumulus from 1 BCE. A tumulus is a grave of a king or important person buried under a man made mountain of rocks and stone. According to the inscription the Karakas Tumulus is the grave of the mother of Mithrios ll. The Septimus Severus Bridge was built during the reign of Septimus Severus over the Cendere River in the 2nd century CE. The Arsimeia Ruins are of a city set up in the 1st century BCE by the Kommagene Family. It was in use until the middle ages. The highlight of the tour was Mount Nemrut. This is the tumulus of King Antiochos Epiphanes (of the Kommagene family) from 1st century BCE. It is 50 meters high and has an East and West Terrace. There are statues of the Gods (including King Antiochos himself!) on both terraces. There were (they have been long gone) also statues of his wife's ancestors and his ancestors. One set being Persian and the other Macedonian. He was trying to convey the merging of the two cultures. The Kommegene Family ruled independently for about 200 years until finally taken over by the Romans at the end of the 1st century CE. We stayed for sunset but without clouds this was not very spectacular. The walk up is steep. We only saw the East Terrace but in hind sight should have walked around to the West Terrace as well. Blame it on the exhaustion of the walk. We are very unfit. The 5 plus kilometers of paved road are also amazing. Especially the time and effort it takes to actually pave a road. And it is HOT! Over 40 degrees Celcius in the van and not much better in the shade. We spent most of our rest day doing nothing but pant. Naturally the air conditioning in the car is not working! On our way again we had to cross an arm of the Ataturk Dam on a ferry. A group of gypsies had just disembarked, all wearing mauve scarves. The reason became evident at the next town where half the population had mauve scarves. There is a political party with mauve as its colour. We drove through the northern edge of the Plain of Harran. It looks very similar to the part of the plain we came across in southern Syria. Lots of rock making cultivation with machines difficult. There is water though thanks to the Ataturk Dam. Further north there are endless wheat fields and no rocks. Trucks are loaded to the hilt with bags of grain. The bags are loaded to over double the height of the cab. Even though the loads are very well secured, the trucks do not look easy to drive because of the camber of the road. All the trucks had a decided tilt away from the centre of the road. True to the superstition of Friday 13th a minibus tried to overtake us while Pieter had already started to overtake another vehicle, on a road surface that was being repaired. The other driver shouted at Pieter who merely shrugged. What can you do? He lost his side mirror. He should have taken note of Pieter's indicator and not tried to force his way through. We had read that there were camp grounds on Lake Van at Edrimet. There are, if you accept a restaurant with a toilet and a sign that says camping as a campsite! Needless to say we ended up in the Migros parking area in Van for the night. The morning was spent having the air conditioning fixed. The fan was blocked and did not turn so a new one had to be fitted. While we were waiting a bus announcing a political party went by handing out pristine white caps with the party motif on the front. The mechanic soon changed that by covering the logo with blue spray paint. Instead of going east from Van to Iran we headed north to Murat Camping in Dogubayazit. At least we expected some sort of campsite where we could stay a day or two and rest and potter. We were happy to see that there were hot showers and electricity. The unfortunate part was that it rained 80% of the time we stayed there. We felt very sorry for the group of trekkers who were off to climb Mt. Ararat. The camp site is directly under Ishak Pasha Palace. The palace was started in 1785 and remained in use for about 100 years. There is an older ruin as well as Bayazit was a stop on the Silk Route from the east to the west. We almost saw Mt Ararat.